Finding your own style should be a discovery and it should be fun. This could be for your interior but also your cloths, or other things which is showing your style such as setting the table, decorating your plate. Magazines, computer, pen, paper, scissors, tape. And their you go. 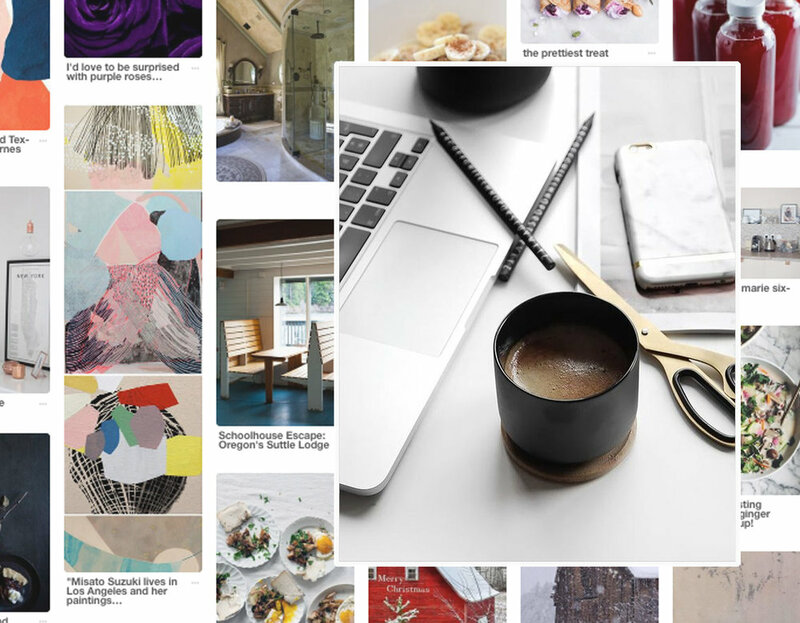 I work all the time with Pinterest to find images, find new brands. If you have no account yet, start making one, you will discover a new world and it will help you to get organized. Google images and Houzz are other good sources you could check. Prepare yourself a nice cup of tea, some music in the background and there you go. When you start looking for images save them in a file on your computer or on a Pinterest board. Don't limit yourself to just interior images, also fashion, food, travel, art....... You will see that everything which is catching your eye is reflecting your interest and also your personal style. Do you see a link between the images you selected or is it just a mix? 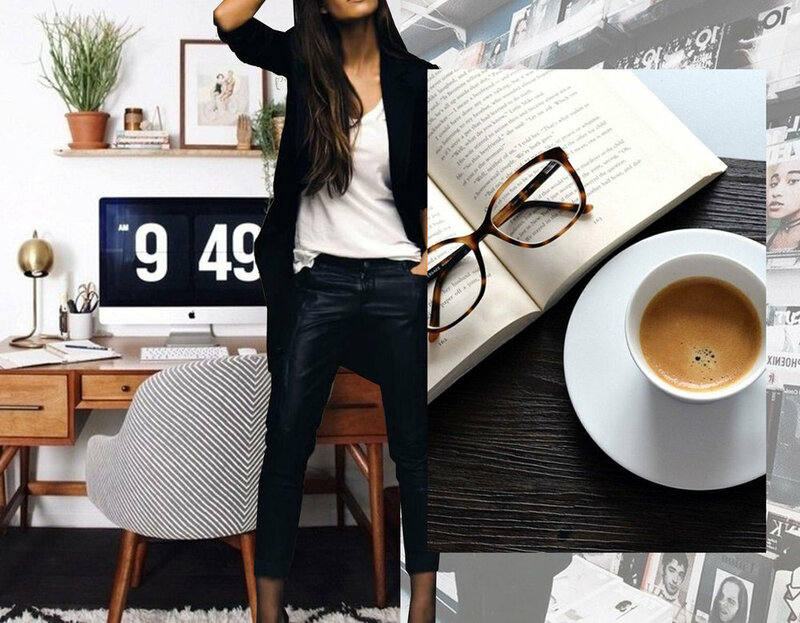 When you have worked with pictures out of magazines you can put them next to each other on the table, or on the wall with a small piece of tape. Make a selection and put aside those you don't see fitting, maybe we can use some of them later again, so don't throw things out to quickly. In case you worked with Pinterest you can divide them on different boards, or in different folders on your computer. Do the images you collected are reflecting the words you wrote down earlier? Or you see now that the words don't always are the right expression of your taste. It is very clear that you like color, clean images, a touch of vintage or retro style. You are not afraid of mixing colors. You go for a very personal style, mixing different prints. Art you creative, with a big interest in art? 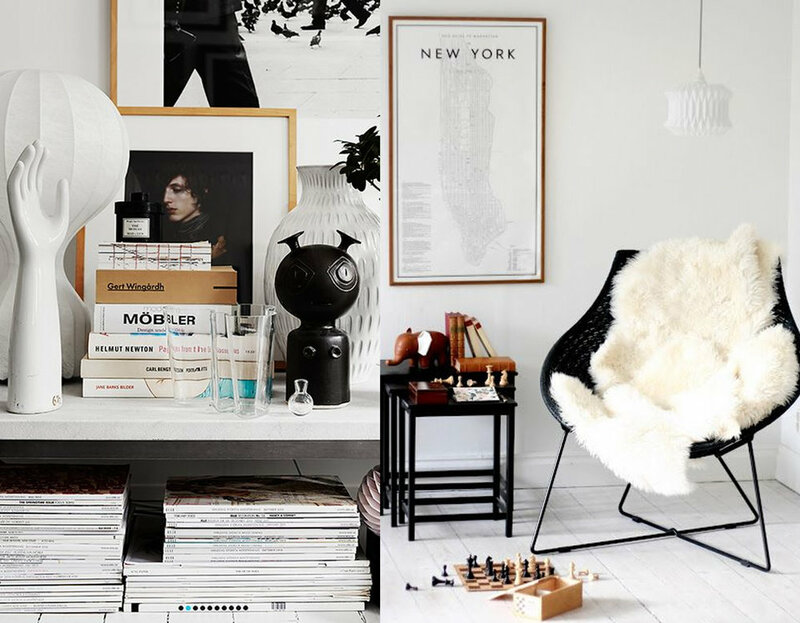 Your home could have a lot of white walls with big art works on them. Or one wall painted in a strong color, a mix of pillows on a colorful sofa. A modern style with clean lines. You go for quality. A contemporary classical style, with some nice design pieces which won't get out of trend. You are not going to follow the latest trend, you want to be sure that the money you invest will be worth it. You prefer to buy some more expensive pieces. A refined color palette with some accents colors. You will create a relaxed home where everything is in a good harmony. Your home will be inviting and relaxing and showing good taste. You have a romantic soul, you love pastel colors, flowers, crystals. But it shouldn't get to sweet: the flowers can be printed big on a mural, vintage items will make your home feel very feminine. Some travel inspiration can bring it all in balance. You are dreaming of holidays, feeling good, no stress. You take the sunny side of life. You like clean lines, neutral colors, nothing should take your inner peace away when you come back after an hectic day in the office. You like good quality, refined materials. Your home should be practical, maybe you are a perfectionist. You have an eye for beauty, art, design pieces which will get a classical in a few years. You reflect well before you say yes to things. Honest, pure, thoughtful. You are an extrovert, you like bold pieces, grandeur. The "less is more" style is not for you. It should be rich and decorated, you love gold and antique pieces. Or you could go more modern with some classical pieces in a Louis the XV style. 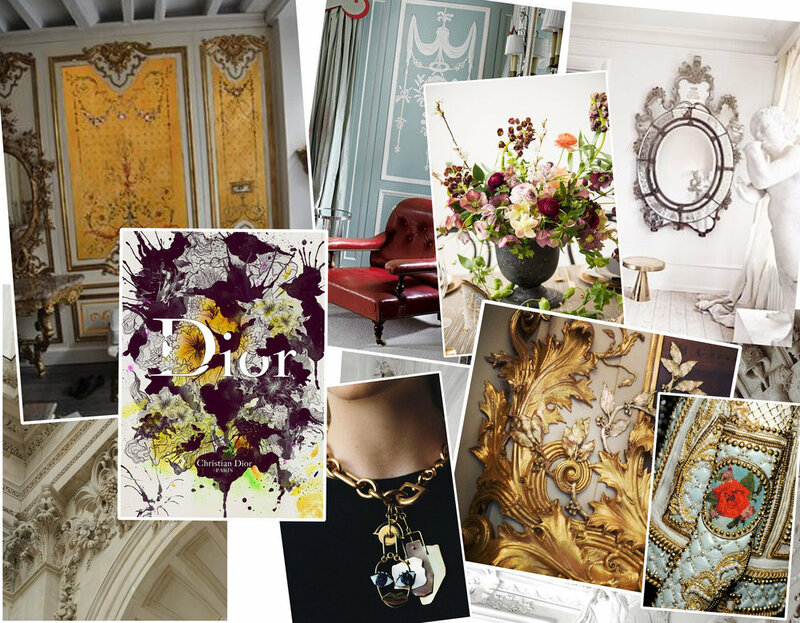 A first mood board can give you a clear direction, afterwards it is important to see if this direction is for the whole house or you would see it more as accents. Decorating a house is a process. I often compare it with slow cooking: the more the food is in the oven, rich combinations, fresh herbs or more oriental condiments it all will add flavor. The same for your interior decorating project, you will discover with each piece you choose more and more your style, so you shouldn't rush to buy all at one time. Don't give up, it all needs time, just continue to be looking around you, be curious. Look around and make pictures of things which are catching your eyes. I will start too, it makes me more aware, it forces me to look and reflect, not just to pass by everything. You will see..... let's make 5 pictures each week. I'll show them on my blog post. Send me your selection and I will choose each week one person, who I found most inspiring and share it on my FB page. You are in for the challenge? Hope you got inspired to discover more about your style, and this not only for your home, can also be for defining your personal style for your garderobe. Not only style, also color, your color, is an important tool in decorating your home. More about this in my next blog post. If you would like to do discover more about your style in a group than watch out for one of my workshops on the topic of "Who am I", they will start soon, we can also work together on discovering your style during a one on one coaching session or even an on-line coaching, just get in contact with me.